Two days is hardly enough understand a different country, culture and way of life, but we learned a lot during our brief time in Beijing. I’m glad the girls have experienced a taste of China. It’s been a positive encounter for them, one that has whet their appetites for more! 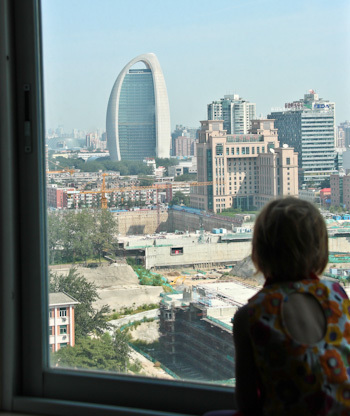 Before we reached China, one of the challenges I faced was booking a place that could accommodate our four-kid family. Although we co-sleep (and can fit together on a king-sized bed), hotels have their fire regulations which dictate how many people can fit into a room. Add to that a cultural norm of one or two children, and we’re pretty odd as a family! I did manage to book a two-bedroom apartment for a reduced rate in a hotel that’s currently undergoing renovations, and when I arrived I was astounded at the high quality of the room which included a kitchenette, washing/drying machine and full living/dining rooms. I loved soaking in the extra-long bath and washing my hair (just with water — I went off shampoo years ago) with the never-ending supply of hot water! The girls enjoyed the breakfast bar — with continental, Chinese and fresh-food options. Because we had a kitchen, we could store and prepare food instead of always relying on restaurants. We’ve only packed a couple of sets of clothes, and so the option to wash and dry clothes means that when we left China, it was with absolutely no dirty laundry! In the morning, I'm amused to find the girls sleeping in close proximity to each other despite the generous size of the bed! I was thrilled to find a hairdryer in the hotel room to use after washing my dreadlocks, and after she was introduced to it, Aisha used it after every shower! 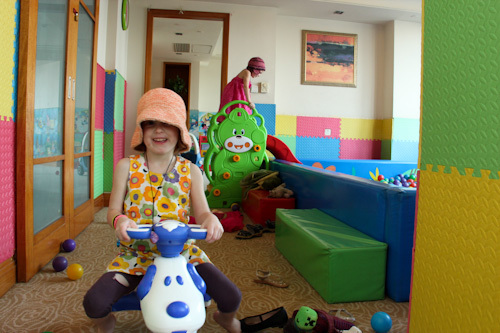 Even though the facilities are quite simple, the girls love playing in the kids' room at our hotel. I like the fact that it includes a free milo/coffee/hot-juice (yes, hot juice!) dispenser. Venturing out from the hotel in the middle of the day, we quickly learned to walk in the shade and to only cross roads in the company of other pedestrians — regardless of what the traffic light gave us permission to do! The girls’ responses to the 30ºC temperature reminded me that our time in the cooler climes of Australia has morphed us into a cooler-weather family. Finding food to suit our tastes wasn’t a problem. Street vendors sell fruit salad and freshly-squeezed juices. Little shops stock fresh fruit and vegies, and dragon fruit, melons and cherry tomatoes are currently in season. We sampled local dates and nuts and discovered that dried strawberries are as tasty as dried mango. Local restaurants provide a variety of dishes based on fungus, tofu and vegetables. The girls love both rice and noodles, and I was encouraged by their enthusiasm for new flavours. The legendary traffic wasn’t as bad as I expected, although there’s almost a complete disregard for traffic signs and signals. Drivers respond accordingly — driving defensively — and pedestrians, cyclists, motorcyclists and cars share the road at a moderate speed and with the deftness of dancers. I was surprised to learn for the first time about the road space rationing in Beijing where private car-use is limited to certain days based on the last digit on the license plate. This meant that our driver used a friend to take us to the airport today because his vehicle wasn’t permitted within the fifth ring road from 7am to 8pm. It seems like an obvious amelioration of the traffic situation, but when I asked Cheryl about it, she laughed and said that wealthy people buy a second car with a different license plate so they’re not forced to take public transport or travel outside peak times! 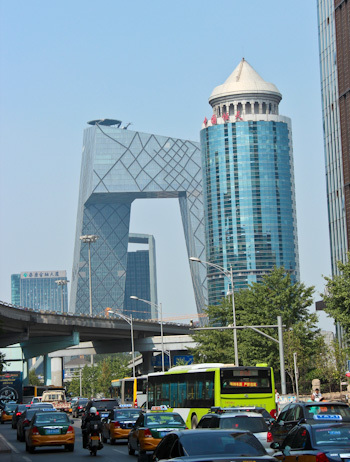 The view from our hotel includes the sci-fi-looking, newly-completed People's Daily newspaper headquarters. 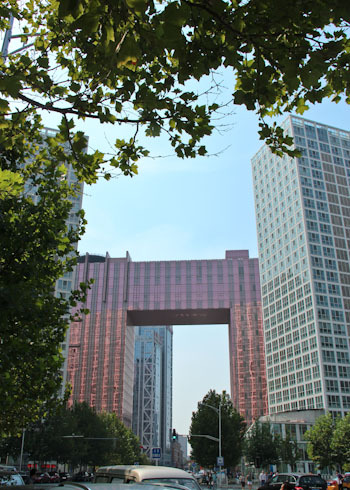 The People’s Daily headquarters infamously had a more phallic appearance during construction, provoking worldwide jokes about the official newspaper of the PRC. I loved the opportunity to see many of the iconic Beijing buildings in person. Some of them were visible from our hotel, and others flashed by as we drove around town. Many are world-famous after the Olympics, and a few were completely new to me. Our guide, Linda, proudly pointed out the Pangu dragon hotel — a seven-star establishment whose buildings form the stylised shape of a dragon. As we walk along the city streets, we catch a glimpse of pink glass of the Fairmont hotel up ahead. As we cross a busy road, two more iconic buildings rise before us: the twisted CCTV headquarters and the round China Garments Mansion. Although we didn’t practice much Mandarin with the locals, the girls’ awareness of written Chinese has been practically enhanced by our book The Pet Dragon. After revising with the book each day, we started recognising characters all around us. With the help of our guide and driver, we quickly learned to decipher other common phrases such as “Bei Jing” and “Middle Country” (China). I feel a pang of awareness that — although they’re privileged to be growing up literate within an English-speaking country — I’m not giving my children an immersive experience into another culture and language. At Lana’s age, I was speaking Hausa fluently, and at sixteen I realised I spoke better French than my mother. Occasionally, I was amused by English written on signs. I didn’t see a lot of Chinglish — unlike during my 2009 visit to Hong Kong — but there were a few gems worth recording. When you're serving a city of 21 million people, there are bound to be complaints — specific complaints, even. It's more efficient to provide the people with a direct number to dial when they want to complain about the prices at the Summer Palace Imperial Gardens. 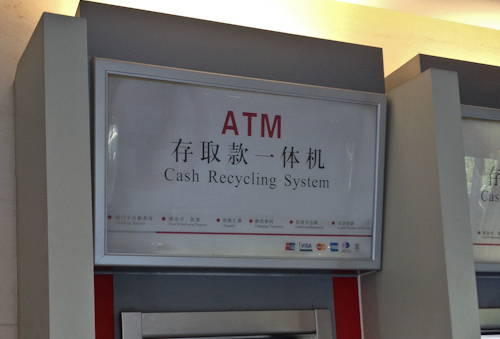 "Cash recycling system" makes a whole lot of sense. After all, an ATM *is* a machine that redistributes notes back into circulation! "Please leave your valuable opinions", the gadget invites. 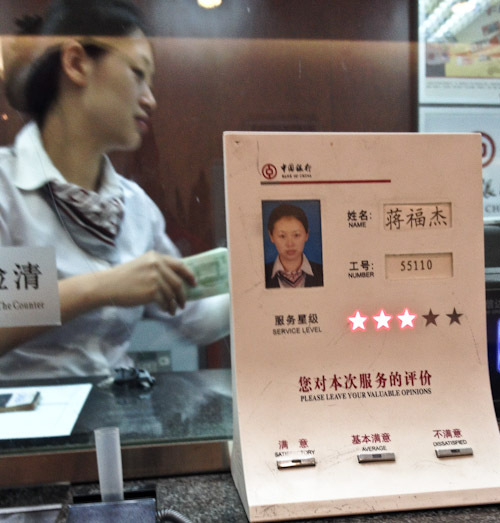 This picture is taken at a bank, but I first saw an electronic service-rater at the immigration desk in the airport. I'm equally enthralled and appalled by such a transparent method of rating someone's service. After receiving slow service both times, I wonder — what is the norm for China? — and thus I decline to register my opinion. My highlight of our visit to Beijing was the opportunity to catch up with my sister-in-law Cheryl. She and David’s brother Ben have been living in China since November 2008. That’s a long time, and we’ve each had babies since then. Obviously we needed to talk about David and Elijah — something that’s always better done in person — and it was fascinating to hear about the Fishers’ life in the context of what I had seen of Beijing. 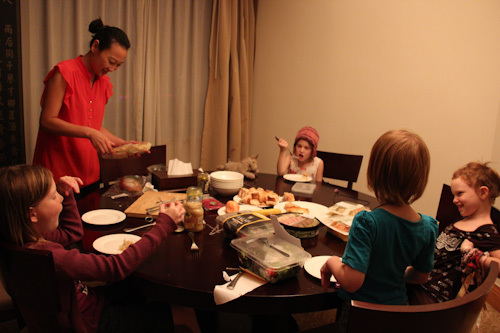 For dinner, Cheryl serves us up a mixed treat of Western and Chinese dishes. The girls try a little bit of everything and settle on the tastes that they like. The girls responded to Cheryl’s warmth and we savoured her treats. She met us again this morning and accompanied us part-way to the airport. It’s been special to re-establish contact with her, and I’m glad that our trip to China has accomplished that! As we fly on to Europe, we’re taking away a good feeling about Beijing — about China! — and perhaps even an inclination to see more of it in the future. No power? No problem in HK! 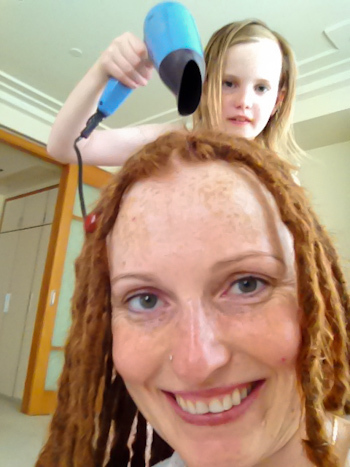 I’m with Aisha, I hate having wet hair and totally in love with my hair dryer – I even take it with me when I travel! I have really loved seeing these glimpses of China, limited as they are. I must admit I didn’t think a visit to China would or could be as nice as this – in my mind it is a perpetually dirty, over crowded dangerous city and I have no idea where I ‘absorbed’ that idea from?! Wow! You guys saw a lot in such a short period of time. Your pictures stir up so many memories of Beijing for me! Looks like you had some fun on your trip to Beijing. Oh how I wish Santa would allow me to leave for a Travel! I got my bumper sticker in the mail today. What an amazing surprise. Thank you so much!